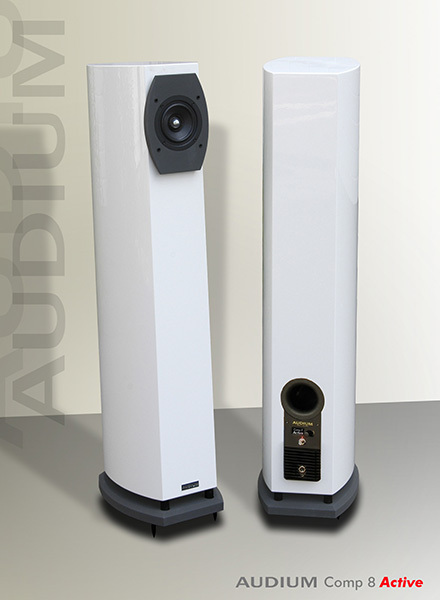 range speaker Comp 8. The active version makes a power amplifier obsolete. You can connect your audio source e.g. a network streamer or your PC directly to the loudspeaker. It powers the full-range driver and the 9" woofer mounted in the bottom plate of the loudspeaker through a 30W and 100W digital amplifier respectively. The integrated DSP performs the work of a classical crossover network and additionally allows an adaptation of the speaker to your listening room and your personal listening preferences. AUDIUM Comp 8 Active - on the pulse of time!